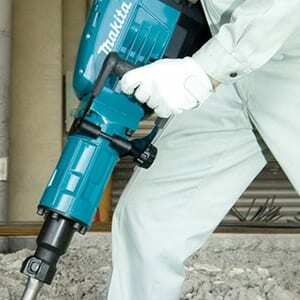 This Heavy Duty Hammer Driller is perfect for drilling, chiselling and gouging channels. This extremely comfortable drill weighs in at less than 6 kg making it ideal for above the shoulder applications. Assembly - Before any work on the machine itself, pull the mains plug. The auxiliary handle can be set to any position for a secure and low-fatigue working posture. Turn the bottom part of the auxiliary handle in counter clockwise direction and swivel the auxiliary handle to the desired position. Then retighten the bottom part of the auxiliary handle by turning in clockwise direction. With the SDS-max tool holder, simpler and easier tool changing is possible without additional aids. 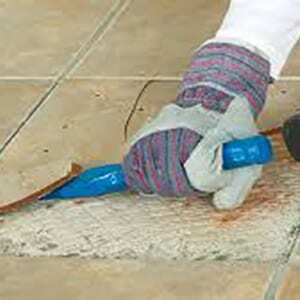 The dust protection cap largely prevents the penetration of dust into the tool holder during operation. 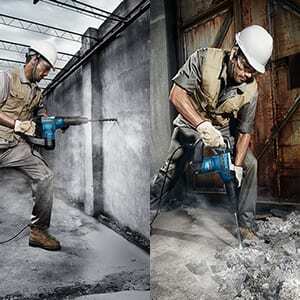 When inserting the tool, pay attention that the dust protection cap is not damaged If damaged return the tool to your nearest BuildEquip branch so that the dust protection cap can be changed immediately. Inserting: Clean and lightly grease the shank end of the tool. Insert the tool in a twisting manner into the tool holder until it latches itself. Check the latching by pulling the tool. Removing: Push back the locking sleeve and remove the tool. The operating mode of the power tool is selected using the mode selector switch. Note: Change the operating mode only when the machine is switched off! Otherwise, the machine can be damaged. Turn the mode selector switch to the desired position. 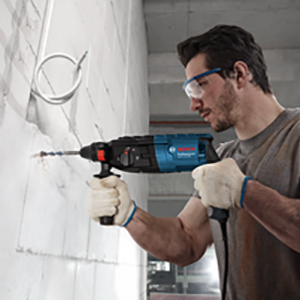 In the “chiselling” position, the impact rate preselected with the thumbwheel is automatically increased when switching on; this causes the power tool to operate with increased capacity when chiselling. To save energy, only switch the power tool on when using it. To start the machine, press the On/Off switch and keep it pressed. To switch off the machine, release the On/Off switch. To start the machine, press the On/Off switch at the top until it locks. To switch off the machine, press the On/Off switch at the bottom and release it. The electronic control enables step less speed and impact pre-selection in accordance with the material to be worked. The constant electronic control keeps the preselected speed and impact rate nearly constant between no-load and load conditions. When plugging the plug into the socket outlet or after a power failure, the constant electronic control automatically sets the highest speed and impact rate. This ensures working at optimum performance despite too low pre-adjustment of the thumbwheel. Select the impact rate with the thumbwheel according to the material. 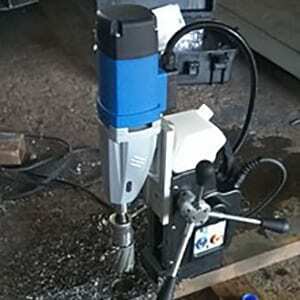 If the tool insert becomes caught or jammed, the drive to the drill spindle is interrupted. Because of the forces that occur, always hold the power tool firmly with both hands and provide for a secure stance. If the power tool jams, switch the machine off and loosen the tool insert. When switching the machine on with the drilling tool jammed, high reaction torques can occur. The chisel can be locked in 12 positions. In this manner, the optimum working position can be set for each application. Insert the chisel into the tool holder. Turn the mode selector switch to the position “VarioLock”. Turn the tool holder to the desired chiselling position. Turn the mode selector switch to the position “Chiselling”. With this, the tool holder is locked. For chiselling, the mode selector switch 3 must always be set to the position “Chiselling”. Use auxiliary handle(s), if supplied with the tool. Loss of control can cause personal injury. Always be sure you have a firm footing. Be sure no one is below when using the tool in high locations. Keep hands away from moving parts. Do not leave the tool running. Operate the tool only when hand-held. Do not touch the bit or parts close to the bit immediately after operation; they may be extremely hot and could burn your skin. Wear ear protectors when impact drilling. Exposure to noise can cause hearing loss. Use appropriate detectors to determine if utility lines are hidden in the work area or call the local utility company for assistance. Contact with electric lines can lead to fire and electric shock. Damaging a gas line can lead to explosion. Penetrating a water line causes property damage or may cause an electric shock. Switch off the power tool immediately when the tool insert jams. Be prepared for high reaction torque that can cause kickback. The tool insert jams when: the power tool is subject to overload or it becomes wedged in the work piece. Hold the machine with a firm grip. High reaction torque can briefly occur while driving in and loosening screws. When working with the machine, always hold it firmly with both hands and provide for a secure stance. The power tool is guided more secure with both hands. Secure the work piece. A work piece clamped with clamping devices or in a vice is held more secure than by hand. Keep your workplace clean. Blends of materials are particularly dangerous. Dust from light alloys can burn or explode. Always wait until the machine has come to a complete stop before placing it down. The tool insert can jam and lead to loss of control over the power tool. Never use the machine with a damaged cable. Do not touch the damaged cable and pull the mains plug when the cable is damaged while working. Damaged cables increase the risk of an electric shock.